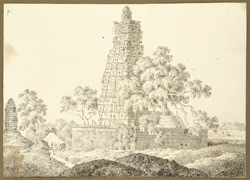 Pen and ink drawing of the Mahabodhi temple at Bodhgaya in Bihar, by Sir Charles D'Oyly (1781-1845), dated 27th December 1824, from an Album of 80 drawings of views in Bengal and Bihar taken between January 1823 and May 1825. The Mahabodhi Temple complex is one of the holiest sites related to the life of the Buddha as it is the place where he attained enlightenment. The present temple dates from the 7th Century with later additions, and was built on the site of a previous temple erected by Emperor Ashoka in the 3rd century BC. The temple consists of a central sanctuary with a tall pyramidal tower that is over 50 metres high and houses a large gilded image of the Buddha. The temple is built in front of the Bodhi Tree, the tree under which the Buddha obtained enlightenment, which is surrounded by a quadrangular stone railing that dates to the 2nd century BC. This image is the original drawing for plate 20 of ''Sketches of the New Road in a Journey from Calcutta to Gyah' (Calcutta, 1830). D'Oyly wrote: "The Temple is situated on a broad terrace, at the West corner of which is one of the finest Pepul Trees in the country, overshadowing its surroundings steps of masonry, and innumerable Idols, placed in recesses, contributions from religious enthusiasts. It is here chiefly that the Pilgrims offer up their prayers, tho' the Gigantic and frightful image of Bhood rests beneath the great pile. The Burmese have erected a Temple to the honor of this God: in the compound of the Mahunts residence, distinguished by the peculiar architecture of that country and the light gilt filagree lanthorns suspended from the pinnacle of the spire and below."